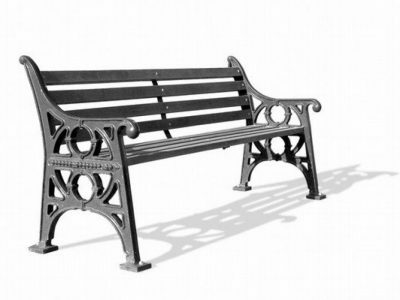 The HIGHGATE seat is illustrated above with the standard hardwood Accoya slats. Polyester powder coated steel slats are available on request. Supplied flat packed for assembly on site—all fittings in stainless steel supplied. Crests, logos and commemorative plaques available. Centre cast support is optional on 1800mm version, standard on other lengths. Cast aluminium ends support 60mm wide x 32mm thick Accoya slats. The seat has four seat and four backrest slats, the bench has five seat slats. The cast aluminium metalwork may be supplied in a primer finish or painted any standard RAL colour. Available in two lengths: 1.8m and 2.4m The 1.8m model has a single central support strap, the 2.4m model has two support straps. With backrest: 1.8m xxkg, 2.4m xxxkg.